President Maithripala Sirisena yesterday said he has already decided on a period of time to execute capital punishment for convicted drug traffickers who carry out large scale drug smuggling operations while in detention. He was speaking at a mass protest against drugs organised by religious leaders led by Colombo Archbishop Cardinal Malcolm Ranjith at the Vystwyke Park in Kotahena. President Sirisena said the Government has taken a number of steps to strengthen laws relevant to curbing illicit drug trade. The President stressed that whatever the challenges or obstacles his battle to eradicate the narcotics problem will continue until it achieves a successful conclusion. “My aim is to ensure a drug free future for the next generation.Whatever the challenges, I will continue this fight until a successful conclusion is achieved” he added. President went on to say that all sections of the society irrespective of differences have come together in the battle against drugs today and achieving the goal of a ‘Drug Free Nation’ was not far away. A silent protest march began from a number of Catholic Churches yesterday after the Sunday services where participants carried placards with slogans against illicit drugs.A rally was held at the Vystwyke Park, Kotahena where three processions coming from different directions merged together. 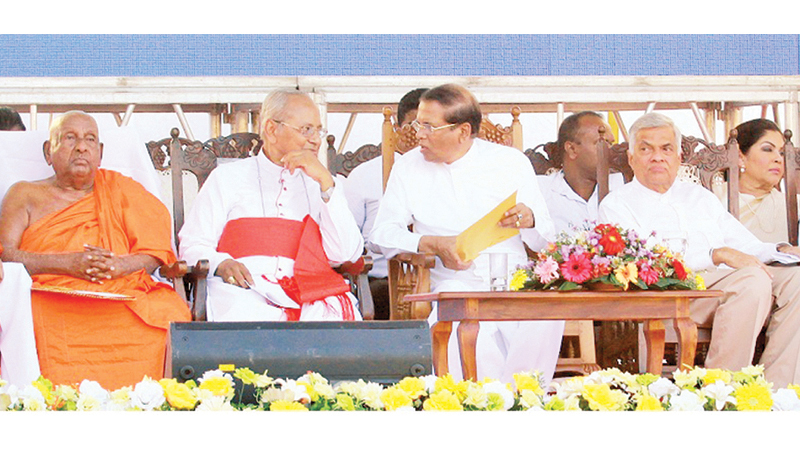 Prime Minister Ranil Wickremesinghe and all religious leaders participated at the rally.